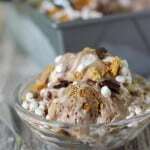 This S’mores ice cream recipe is easy to make without an ice cream machine. It includes all of the important things: Hershey’s bars, graham crackers and marshmallows. It isn’t summer if there aren’t s’mores! We’ve already had s’mores a couple of times this year. We have a small outdoor fire pit that is perfect for having bonfires. My kids enjoy sitting out by the fire with their friends, just hanging out, visiting and eating s’mores. 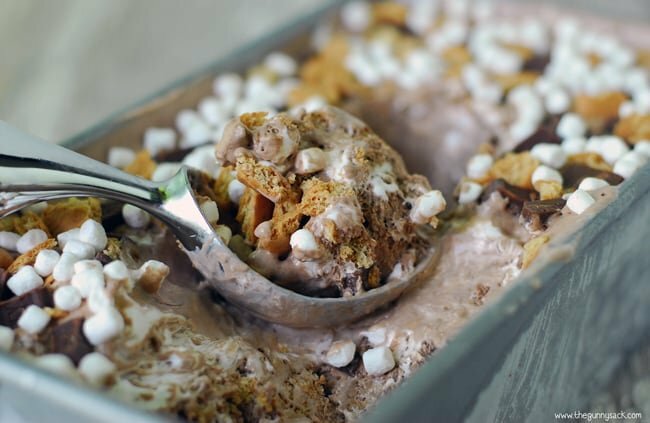 But for the times that it isn’t convenient to have a bonfire, there’s s’mores ice cream! This is a no churn, no ice cream machine recipe. You mix up the ingredients, pop it into the freezer overnight and your homemade ice cream is ready. Whip a pint of cold heavy whipping cream using a chilled mixing bowl until firm peaks form. Use a spatula to fold the sweetened condensed milk, vanilla, cocoa powder, and chocolate syrup into the whipped cream without deflating it. Spread the mixture in a loaf pan. 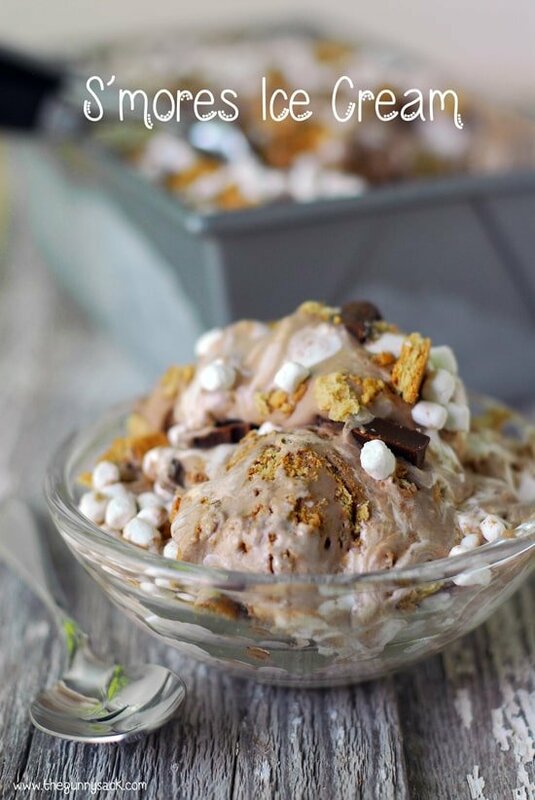 Every s’more needs chocolate, so this s’mores ice cream starts with chopped up Hershey’s bars. I cut them so that they are like mini candy bars. 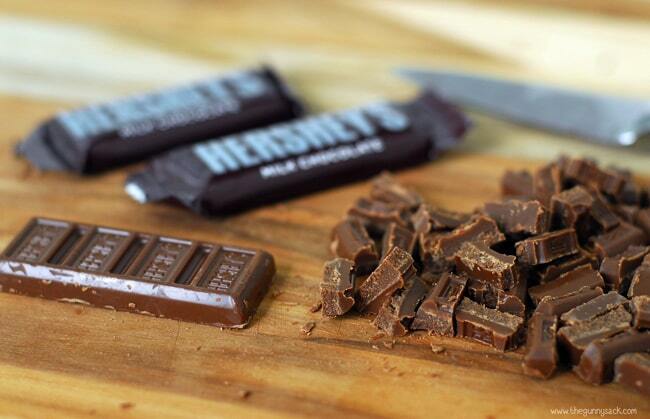 Add 1/2 cup of the chopped Hershey’s bars and 1/2 cup chopped graham crackers. Stir gently to disperse throughout the pan. Top the ice cream with marshmallow cream and use a knife to swirl it into the ice cream. To add more texture and make it look pretty, sprinkle the ice cream with 1/4 cup chopped Hershey’s bars, 1/4 cup chopped graham crackers and 1/4 cup mini marshmallows. Tightly cover the pan with plastic wrap and place it in the freezer for 8 hours or overnight, until firm. 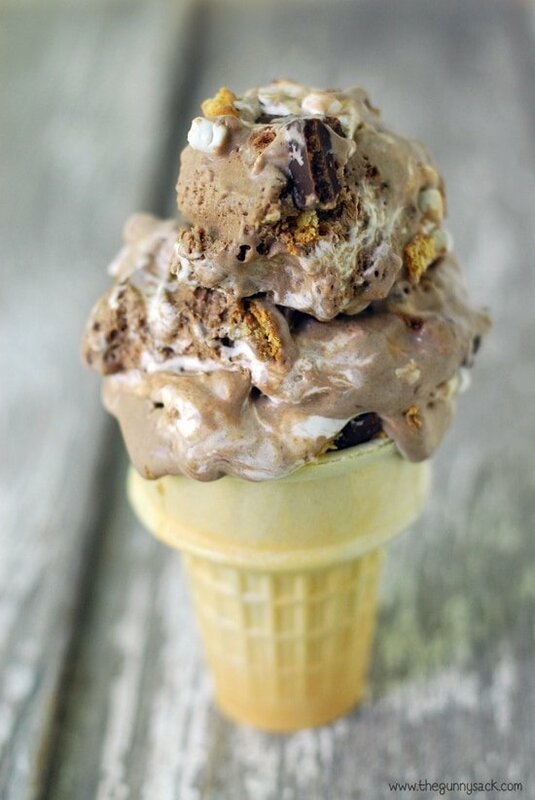 Scoop the S’more ice cream into dishes or into a cone when ready to eat. I think it would be really fun to top each dish with a toasted marshmallow right before serving. 1. Can I use Cool Whip to make no-churn ice cream? Yes, use four cups of Cool Whip instead of the whipped cream. 2. Do you have a lighter no-churn ice cream recipe? You can use light Cool Whip, fat-free sweetened condensed milk, and sugar-free chocolate. 3. What other flavors do you suggest? The sky is the limit when it comes to no churn ice cream! Add any of your favorite mix-ins from espresso powder to peanut butter. Want More S’mores Recipes? We’ve Got You Covered! S’mores Pie Pops: A s’more is a quintessential summer dessert and this easy S’more Pie Pops recipe captures the goodness of s’mores in a flaky pie crust. S’mores Eclair Cake: This easy to make No Bake S’mores Eclair Cake recipe has luscious layers of graham crackers, vanilla pudding and chocolate topped with toasted marshmallows. S’mores Cheesecake: No Bake S’mores Cheesecake is easy to make with creamy chocolate filling, chocolate ganache, a graham cracker crust and toasted marshmallows on top! S’mores Bars: This S’mores Bars recipe has a graham cracker cookie crust topped with toasted marshmallows and Hershey Kisses! Can’t build a bonfire to make s’mores? Make everyone happy with this smores bars recipe instead. his S’mores ice cream recipe is easy to make without an ice cream machine. It includes all of the important things: Hershey’s bars, graham crackers, and marshmallows. Whip the pint of heavy whipping cream until stiff peaks form. Fold the sweetened condensed milk, vanilla, cocoa powder and chocolate syrup into the whipped cream. Add 1/2 cup chopped Hershey's bars and 1/2 cup chopped graham crackers. Stir gently to disperse throughout the pan. Top with marshmallow cream and swirl with a knife. 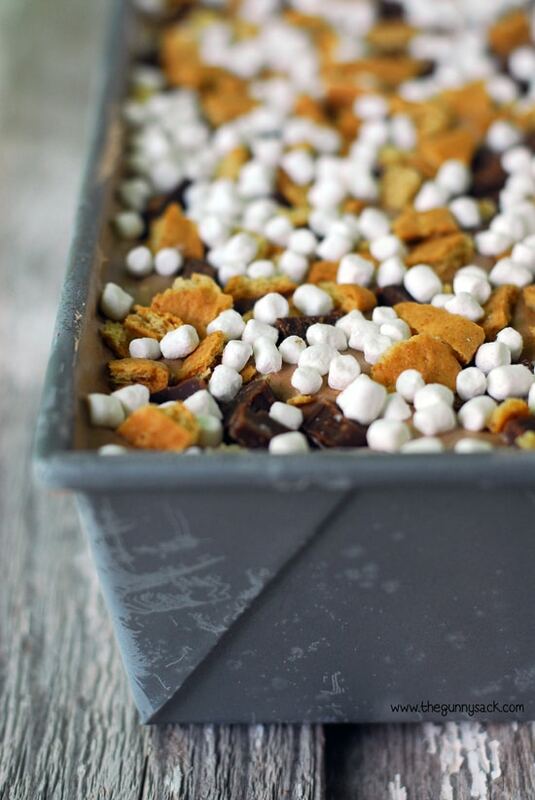 Sprinkle with 1/4 cup chopped Hershey's bars, 1/4 cup chopped graham crackers and 1/4 cup mini marshmallows. This sounds great and no icecream machine is what I like to hear! This looks absolutely amazing! Can’t wait to give it a try! I do have a question. What is vanilla bean paste and where is it located in the store? Thanks! Thanks, Jayne! Here is the vanilla bean paste I use: http://www.nielsenmassey.com/culinary/products-pure-vanilla-bean-paste.php It is available at Williams-Sonoma and on Amazon. But you can use vanilla extract instead of vanilla bean paste! Best of luck! Yes to this ice cream!!! Yes!! This is heaven!!! Insanely good. I love the chunks of graham crackers. Oh who am I kidding, I love everything about it. Thanks, Zainab! I totally agree! YUM!!! I love a good S’mores Ice cream!! Thanks, Julianne! I think I love s’mores any way I can get them!